Hey y'all - time for some True Story Tuesday fun! Y'all know the rules - write your hilarious, amazing, outrageous, miraculous and (mostly) true stories and link up below for some visits from your favorite bloggy friends. You guys have come up with some doozies that seriously tested our bladder control and we can't wait for this week! I'm quite sure that you all know that Rach is profoundly deaf. WELLLLLLL, that is kinda like my Rach. she is not totally deaf, just mostly deaf. Like the time she mistook a German Shepherd that she ran over for a moose. No, for reals... it really was. I was on my way home from my late night ballet class and it was raining buckets in the good ol' Pacific Northwest. I was a new driver (no comments from the peanut gallery about my legendary "New Driver" status), and trying my darndest to make it home safely in my teeny four-door Civic. When suddenly in the road before me appeared a large prostrate form (I am NOT admitting that I am madly giggling because I mix up the words to "All Hail The Power of Jesus' Name, Let Angels PROSTATE Fall"). I swerved but it was too late. A massive BUMP jarred my entire little car and caused no small freakout for this 16-year-old ballerina who nearly peed her tights. I was too terrified to stop and could see nothing through the sheets of rain. I got home and looked at the front of my car. My parents came outside at the sound of my hysterics. The bumper was painted a lovely shade of red and there were chunks of "stuff" stuck in the undercarriage. I begged my dad to drive back to the scene with me to make sure nothing was still alive - though I was certain whatever it was had been not-alive before our little encounter. He quite bemusedly refused. "I don't know *sob*, but it was BIG!" "I don't know Dad *sob*, it was SOOOO BIG!" "What, was it a moose or something?" "What? I don't know *sob*"
And that, my friends, was "how I hit a moose". Would you guys please let this total legend DIE?!? Does an Angel even have a Prostate???? Ok! Ok!!!! back to the point. She leaves the house in typical ladylike fashion "pushing the clock to the last minute" So imagine my concern when my cell rings a few minutes later and it says Rachel. "YEAAAAaaah!!!! there is a dead cougar in the road.... you know in the S-corner by the new house on the hill?" "OK ..... R U OK?" "yea. I'm sure it's a cougar"
I'm thinking OK what am I supposed to do with this???? "Yea shoulda gone with my gut feeling on this one"
Rach In: So Mr. Daddy text messages his wife about the non-cougar... who was so-very cougar-like in color, size, and shape, and all I can think is, "do.not.tell.my.dad." To which my lovely husband replies, "what's it worth to you?" I go merrily about my workday and lo-and-behold, Mr. Daddy's brother walks right up, punches me in the arm, and says, "a cougar, huh?" and collapses in laughter. Rach in: I tell ya, it's a roadkill conspiracy! You know you've got some of these nutty stories buried in your blogs or in your family legends! Just grab the button code from the right sidebar, paste it into your post and link it up below. (Make sure to link the actual post, not your entire blog - otherwise your post will get lost). We'll be by for some comment love! Can I just say how much I love posts like this, with the back & forth between both of you! So funny! lmbo I just found ya'll today and I am glad I did.. I will add your botton to my blog carnival roll on my page.. cougar *snort.. Ok in her defense in that moment I can totally relate to thinking one thing and finding out another. 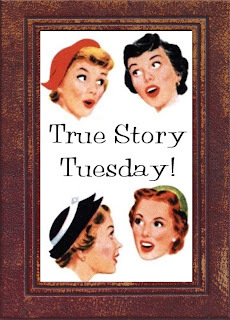 I look forward to True Story Tuesday with you guys....for one, the stories are never dull and for the other, its great how you both jump in on the story....love it. the two of you crack me up!!! That entire post was hilarious! OK Rachel, I need to go back and make sure you had my back on the Ram running through my front yard story before I can take your side. 'Cause alls fair in love and blogging as long as you're nice to me, right? Right?! 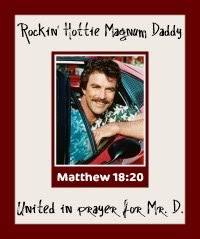 And I think it's time you pull out some embarrassing but true stories about Mr. Daddy. You certainly owe him a couple! ROTF. Hilarious. Although I totally sympathize with Rachel. When you're driving along not expecting to see something random like that it can be a shock. Once I thought I hit a hawk with my car and when we went out too look, it was just a teeny bat stuck to the front bumper. (Disgusting, I know.) But I swear it looked bigger flying at my car! You two are so funny! Rach, I would say next time just drive on by! Pay no attention to the carcass! OMGosh I can't stop laughing. Too funny! Oh goodness! That is hilarious! OMW! Okay, as a lover of German Shepherds, Daddy Bub must NOT read this. LOL! LOL!!! The moose, the angel's prostate, the reference to the Princess Bride ... I can't catch my breath! LMAO y'all are so great together!!! Rach...I've got your back when it comes to identifying animals...who cares exactly what kind it is, it's just a dead animal dangit!!! oh, my goodness... i am totally cracking up here. You guys are something. and I am with Julie, time to break out the "uglies" on Mr. daddy. Just sayin'. Oh Lordy Be! You just reminded me of another great Katiebug story. Stay tuned! Do you realize that this post is not published as your newest entry? I was so confused for a while. I linked to your homepage and not to this post and so no one from my page is finding it. And the official word is in Mr. Daddy. Rachel is of sound mind and body and therefore any more harrassment of her is punishable by severe beatings about the head and neck. That is really funny! Although not for the people in the new house on the hill! Don't feel bad, I probably would have mistaken a pit bull for a cougar too. Too funny. The both of your crack me up, always. Don't feel bad. I can not see. I have to ask my husband to find my glasses on the night stand right next to me before I get out of bed. It is no good. I want an embarrassing story on Mr. Daddy! I know he's got some in the closet. HAHAHA I just snorted because I laughed so hard. Now hubby is making fun of me. At least you're mistaking animals for animals!! I freak out driving on the backroads from Johnson Point, thinking that every stupid MAILBOX is a deer, raccoon, moose, cougar, whatever. I swerve (or if I'm the passenger, I scream, grab the door, etc.) and Chad will always say, "Oooh, watch out! A scary mailbox!" Ugh. p.s. more signs for Aidan - he's doing "open" and "dog"!! Woohoo!!! And I decided I'm adding a few signs to "Yellow Submarine" for my Beatles concert. Heehee "Submarine" is pretty fun! omg i died laughing! came upon your blog today and love!! will be back for more!